Conservative candidate Jair Bolsonaro won the first round of Brazil’s presidential election Sunday, securing the top spot against socialist Fernando Haddad in a run-off race scheduled for October 28. 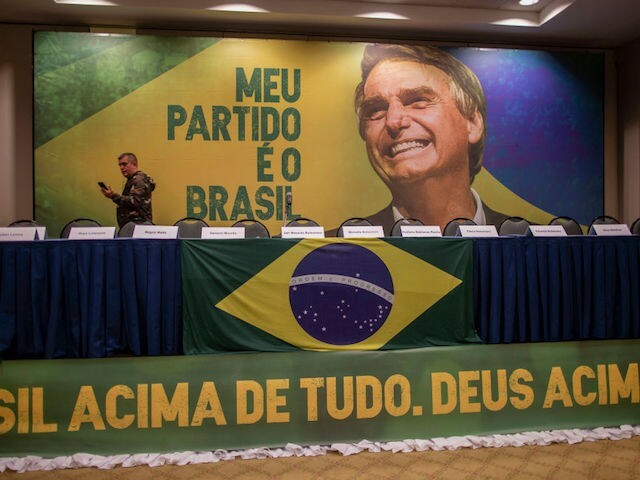 Bolsonaro, representing the right-wing Social Liberal Party (PSL), almost secured the 50 percent of the vote necessary to become president without a second election. With 98 percent of precincts reporting, O Globo reports that Bolsonaro received 46.43 percent of the vote, about 49 million votes. Haddad of the socialist Workers’ Party (PT) came in second with 28.73 percent of the vote, or slightly over 30 million votes, at press time. Final tallies are subject to change as the final precincts report their votes. Bolsonaro outperformed the latest polls taken late last week. A poll by the firm Datafolha found 39 percent of voters saying they would vote for Bolsonaro. Haddad also appeared to pick up some voters, having received 25 percent of respondents’ support in that latest poll. Datafolha found, as another poll by the firm Ibope did last week, that Haddad and Bolsonaro would be in a statistical tie in a run-off election. Bolsonaro released a short video Sunday night thanking Brazilians and urging them to maintain their enthusiasm for his campaign through the run-off election. “I am very thankful to those who voted for me, together we will construct our Brazil, God willing,” he concluded. Bolsonaro’s supporters maintained a festive climate outside the candidate’s house and throughout the country in major rallies, singing the national anthem.